Under the great plane-tree men, too, find peace at Eyoub. Groups sit idly and watch the birds scatter about the court, or look up through cascades of leaves. Through a gateway one may look into the sacred inner court. In its center a rectangular grille, done in green and gold with a marble fountain at each corner, encloses an oasis of verdure shaded by venerable trees. The only other entrance to the mosque faces one across the court, and is approached through the stone streets that pass among the tombs. 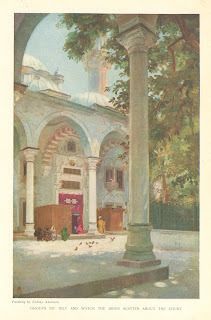 To the right a red curtain hangs within the carved marble portal of the mosque. Facing this on the left, let into a wall brilliant with ancient tiles in blue, is a beautiful gilded grille. Its center is fretwork in brass cut in Arabic char­acters, and in the middle is a small open­ing through which worshipers may peer. Rich silken curtains hang inside, that may be drawn should evil eyes seek to penetrate its mystery. Within is the most sacred spot in the Turkish Empire, as the mosque and its groves are the most revered. One day I tried to look inside. A dervish came quickly to the grille and blocked the view, the curtains were drawn, and a veiled woman who was in the court came forward and said im­pressively, "Yasak," which means "It is forbidden." Yet I often hovered within the sacred court, as near to the grille as I dared, and for a whole month from its farther side, as my picture grew, I watched the outward expressions of the mystery. It is an Oriental tale, and began in the dim ages past, when Mohammed lived and miracles happened in the sight of men. Having subdued the pagan tribes around Mecca, and desiring to carry the religion of the only true God out into the world, he sought a standard-bearer who would be chosen by Allah, and not by mortal man. A sacred dromedary was selected, and all the people of Mecca were warned that upon a certain day the prophet himself would ride this inspired beast through the streets, and no man the conqueror, took the city that once was Byzantium, then became Constantinople, and now is known to the world as Stamboul. 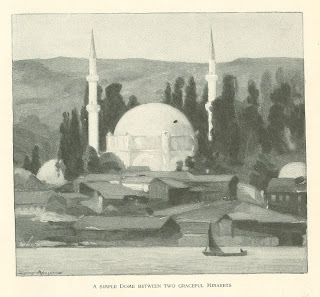 Out beyond the walls, in the pasture lands where a hill covered with stately cypress trees overlooks the Golden Horn, then descends into a sheltered valley, a shepherd tended his flock of sheep and goats. He told a tale to the soldiers of the conqueror which brought the holy men and the Sultan Mohammed himself to the spot. In the pastures where the flocks grazed, the long, dry days of rain­less summer burned the grass brown and dry all save a circle that remained always, on the hottest day, a cool, moist green. Yet the flocks avoided this grass and never ate of it. Marveling upon this, the wise men who came with the conqueror bethought them and remem­bered the death of the saintly Eyoub Ansari, and believed surely that this must be his burial - place. But before they would erect a monument to the brave Eyoub they gathered round about the circle of green and called upon Allah to give them a sign. Immediately a foot appeared above the ground! Then they worshiped Allah, and revered the memory of Eyoub, a great warrior and a holy man, who died for the Cres­cent. The conqueror caused a mausoleum to be built upon this site, and gave it in charge of the most holy dervishes, who guard it, and they only may enter it to this day. Not even the Sultan is per­mitted to enter ex­cept once only in his life, the day on which the sword of Osman makes him Commander of the Faithful. The original mosque has passed away, and the pres­ent building of white marble, with two beautiful minarets and an inner and outer court, was erected about 1799. Ever since its foun­dation the mosque has been forbidden to Christians, and all others not of the true faith. During his visit to Constanti­nople as the guest of Sultan Abdul Ha­mid, the German em­peror used every per­suasion, but all of should interfere with it or divert it from its will. But at the house of whichever man it stopped, he was the chosen of Allah to carry the standard of Islam against the infidel. Covetous of the post, in their wiles the Arabs bought the choicest herbs, that were as the sweets of life to the camels of the desert, and hung them upon their doors that the beast might be induced to halt and feed. Heedless of these carefully planned seductions, the dromedary passed slowly on, leaving disappointed Meccans behind, till it came to the only house in the whole city that was not provided with a lure. The owner was even too poor to buy grass. Here the sacred beast halted, and the prophet descended to enter, but the man and his wife came out of the house and respectfully stood aside. "Why do you leave your house?" asked Mohammed. "When the Messenger of Allah enters it there is no place for me; my house is thine," said the man. "Know, 0 man, that Allah has chosen thee to be his standard bearer. Thou shalt be the protector of the faithful in the land of the Romans." Then the man bowed down before the prophet, and, kissing the hem of his garment, praised Allah in his name. The man's name was Eyoub Ansari. For many years he bore nobly the stand­ard of Islam. As he was growing old, one day he presented himself to Mohammed, prepared as for a journey, and with forty armed men. "Whither goest thou?" demanded the prophet. "To take the city of Constantine, for hast thou not spoken, 0 Prophet of Allah, with thine own lips, what has been re­vealed when thou saidst: 'Knowest thou a city whose two sides look upon the sea, and its third side upon the land? It will fall, not by weapons of war, but by the power of these words, "There is no God but Allah; Allah is great!'" And in the Koran is it not written, 'The greatest of princes is he who will make that conquest, and the greatest armies will be his'?" Thus spoke Eyoub. The prophet looked at the aged war­rior and at his few followers and mar­veled at the courage of the man. Then he said: "0 Eyoub, thou wilt not suc­ceed, for surely the time has not yet come." Eyoub replied: "So be it, 0 Prophet of God. I can but try, and the grave of a martyr is an honorable one." "Then go," said Mohammed, "and Allah be with thee." With what followers he could gather on the way, Eyoub arrived at last almost at the walls of the Greco-Roman city, but his advance being perceived, an army was sent out against him. Eyoub was killed, and his little band was utterly destroyed. Eyoub died a man of eighty years, and this happened in A.D. 668. As the centuries passed, fired by the prophecy, again and again the Arabs rolled their legions against" the third side that looks upon the land," only to perish in thousands, and leave upon the hillsides an army of graves. But the fate of men and cities was surely being worked out, even as it was written. The Turkish Empire did not yet exist. The power of the califs in the south had decayed. Independent princes of Turkish tribes fought one another for the land of Asia Minor. The Greek power in Constantinople was on the wane. Tartar invaders struck where they could. One day Ertoghrul, a Turk­ish tribal prince, set out with a following of four hundred horsemen to seek his kinsman, the Emir Alaeddin. He became Alaeddin's greatest general, and carried victorious arms into surrounding lands. This was the nucleus of the Turkish Empire that under Ertoghrul's son Osman, who succeeded Alaeddin, reached to the shores of the Black Sea. So the Turkish nation is unknown to itself as "Turkish" (that being an opprobrious term suggesting barbarian), but they know themselves as Osmanlis, and it is the sword of Osman whom they regard as the father of their country - that is girded upon each sultan at Eyoub, when the sacred rank is set upon him, just as in the rest of Europe a crown is placed upon the head of a king. The descendants of Osman fought their way nearer. and nearer to Con­stantinople, Allah aiding them by throw­ing down the walls of cities by earth­quakes, that Turkish generals might enter without a blow. At last the prophecy was fulfilled, and Mohammed II. his power could not gain permission even to set foot in the outer court. It is said that during the Crimean War a French officer in disguise entered the baths at­tached to the mosque. He dropped dead on the spot! Later two other ad­venturous spirits entered the court in Moslem robes, and they at once fell down in a swoon, though tradition omits their ultimate fate. But times have changed. In the re­construction after the recent revolution, the Young Turks threw down many of the sacred traditions of their race, and by their order the gates of the mosque were opened to the feet of the un­believer, much to the anger of the clergy, who watch with keen disfavor the pres­ence of the alien hat. Wearing a fez, one may pass unheeded in the court. An Englishman who loves this land and its people led me to Eyoub one perfect July day. Women were feed­ing the pigeons, believing this a potent act that would bring news from distant friends. Pilgrims passed in, resting upon their staves and murmuring, "Allah, Allah," as they passed within the gate. In a corner of the outer court is a door painted in green and gold, guarded by a crimson curtain. Here women alone may enter, and as they pass within they leave their shoes in charge of a turbaned man. Next to this is a turbeh, or tomb of a saint, open to view, but always guarded by a priest. Within the cham­ber a Koran rests upon a stand, and many brass candlesticks surround the large wooden sarcophagus. Upon this at the head, fixed on a short pole, is the turban of the dead saint. As one enters the inner court a grated window shows this interior on the left. Set in the same wall, a little farther on, appears the sacred grille which screens the ever-present mystery of that revered spot where Eyoub rests. An aged holy man sits near the grille at the base of a column, and chants the Koran in a mellow voice, with the lilt of Oriental music in its strange turns. The cooing of the doves mingles through the marble court with the echo of his endless song. Veiled black specters pass within the court, their rustling silks blending with the whisper of the trees. They raise their heavy veils and bathe pale, delicate faces in the marble basins, then pause before the grille and stand in silent prayer, outstretched palms up­turned for the blessing of Allah. Chil­dren play about, heedless of this brood­ing mystery, and cats prowl with padded steps over the stones. It was upon this scene that I came another day, not without some dread in my heart, and set up an easel, then began to paint. The black specters paused in amazement, then passed on. The children ceased their play, and gathered in silent groups to regard the sacrilege of the infidel. A crowd of men and boys gathered and spoke in low tones. Often I heard the dreaded "Ya­sak " passed among them. Priests passed about and looked with a puzzled air, surely believing that I had some power­ful protection to dare this thing, and fearing to interfere. When the crowd pressed too close, one of the priests re­monstrated and drove them back. My English comrade came and went rather nervously. A very old woman dressed in faded black, her face unveiled, leaning her bent form on a staff, halted and peered at this unwonted sight. She be­gan to wail and cry aloud to Allah, then beat her stick upon the ground. But the small crowd hustled her rather roughly along, and she went on to the shrine, muttering threateningly. During the afternoon, hearing French spoken, I turned to see a little, slight, elderly man in modern dress, but wear­ing a fez, talking animatedly to my companion. Unknown to me, the dra­matis personae of tomorrow's perform­ance were unconsciously assembling, for just then two policemen passed. The little gray man talking French, I was afterward to discover, is known to the village of Eyoub as Abraham Effendi. He is a Karsite Jew, and they claim to have been in this part of the world even when the Greeks founded Byzantium. An ancient and honorable people, they gained freedom from taxation, with other privileges, by granting the ground to a saintly Turkish lady, on which she built the Yeni Valideh Mosque in Stamboul. Tomorrow came, and with it the sun­light in the court filtering through the sacred trees. The life of worship and mystery went on about me. The muez­zin called for noonday prayer, and the imams chanted the service, musically, under the great dome. 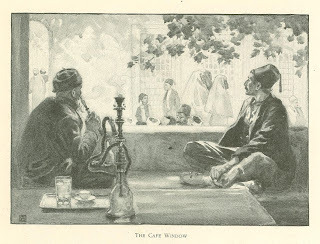 Absorbed in the painting of marble against a sky of delicate blue, the sense of danger had been lulled to sleep in me by the som­nolent chant of the holy man repeating his Koran near the grille. Suddenly his chant ceased. I heard hurrying feet and looked up to see a police cap­tain and two men, followed by a num­ber of priests, a noisy mob at their heels, making toward me. I kept my seat and regarded the captain quietly. With unmistakable gesture, but in a language that I did not understand, he ordered me out of the place. But I re­mained seated, and indicated that I did not comprehend either his word or his meaning, and painted a stroke or two to show my unconcern. My coolness affected him. He seemed to conclude that I must have permission. After some further parley he put a guard of two police over me, and went off to consult I know not whom. I called him back, then led him to the shop of Abraham Effendi. He championed my cause nobly, and returned with me to the crowd, the deserted easel; and the two policemen in the court. The captain had gone off to report. A fanatic prompt­ly shouted defiance at Abraham, and he, no longer peaceful, shouted a reply. Then we witnessed an Oriental duel, in which the human hand and face per­formed the most vehement gestures and violent contortions, and the sacred court rang with a noise that frightened away the pigeons and brought the holy man hobbling on his stick. A group of Turkish naval officers, dressed in white but wearing the fez, joined the crowd. One of these, a gen­tleman like fellow, spoke limited Eng­lish and gave me glimpses of what was going on around. I suggested that the Embassy might help, or one could ap­proach the Sheik-ul-Islam. He replied, "That might be, but we must wait till the police captain has returned." Abraham Effendi and his black bearded adversary were still shouting at each other, the crowd alternately agreeing with this one and that, when a third policeman arrived smiling, to say that I might stay and" paint freely," as the naval officer interpreted. He and his companions saluted pleasantly, and went to pray at the shrine. The crowd melted to normal proportions. Some of the by­standers, apparently, were pleased at the outcome, others discontented. Abraham Effendi stood guard over me for a time; then, with a parting admonition to call him when in trouble, he went off to his shop, and I painted quietly till the shadows fell after the evening prayer. Probably it never will be revealed who granted this unusual permission, but it seems possible that someone had sought and gained in high places a like privi­lege, and through mistaken identity for the time being, I was permitted to enjoy another's good fortune. Friday, the Sunday of Islam, arrived with all its sacred ceremony. Wise­ly I left my paint­ boxes behind and remained outside the gate, beside a friendly police­man, to watch the forms of worship in the court. The quiet of peace and seclusion that rests upon the mosque for six days departs upon the seventh. A multitude fills the place. Yellow matting covers the inner court, and hundreds who can­not enter the crowded mosque go through the prescribed move­ments, looking toward Mecca, in the court. It is a motley crowd. Hammals and boatmen from the wharves and ca­iques of the Gold­en Horn, great, picturesque brigands in gorgeous reds and blues, mingle with old Turks in robes of biscuit gray or brilliant yellow. Many, alas! are in modern European dress, with only the fez to mark their race and religion. Upon this day no one even glanced at the solitary infidel wearing a gray cloth cap. The policeman made a motion like one sketching on the palm of his hand, then shook his head. " It is not good to try it today," he intended to communicate. After the crowd had gone and the mats were rolled up, I entered the court. Pla­cards in Arabic, printed or written on cards of yellow, buff, or white, often edged with blue or purple, were hung all over the two wooden houses that stand sentinel by the mosque door and shelter the shoes of the worshipers. Round two sides of the court the walls were covered with these for nine feet above the ground, hung as closely as pictures in an exhibi­tion. Men lingered to read what was written on them. The effect was novel and picturesque, but it was noisy to the mind, and like the crowds of Friday and feast­ days, it drove away the spirit of peace that dwells within these courts. The village looks up to the mosque, as in feu­dal Europe the hamlet looked up to the castle. The imams are the lords of Eyoub, and their white turbans and flow­ing robes are gravely saluted in the streets. Although they have salaries from the foundation which supports the mosque, yet they are free to en­gage in trade. It is not uncommon in a Turkish vil­lage to discover that an imam owns the melon shop, or he may prove to be the milkman. They marry and live in their own houses, though quarters are provided in the mosque for those who remain single or care to reside there. The usual school, or medressseh, for the education of softas (theological students), is attached to the mosque. Here the imams teach and the students learn the muezzin cry, all the lore of the Koran, and how to intone the service for the living and the dead. Before a student becomes a full-fledged imam, it is said, he must study for fifteen years, and then be examined at the headquarters of the Sheik-ul-Islam, in order to be admitted formally to the clergy. 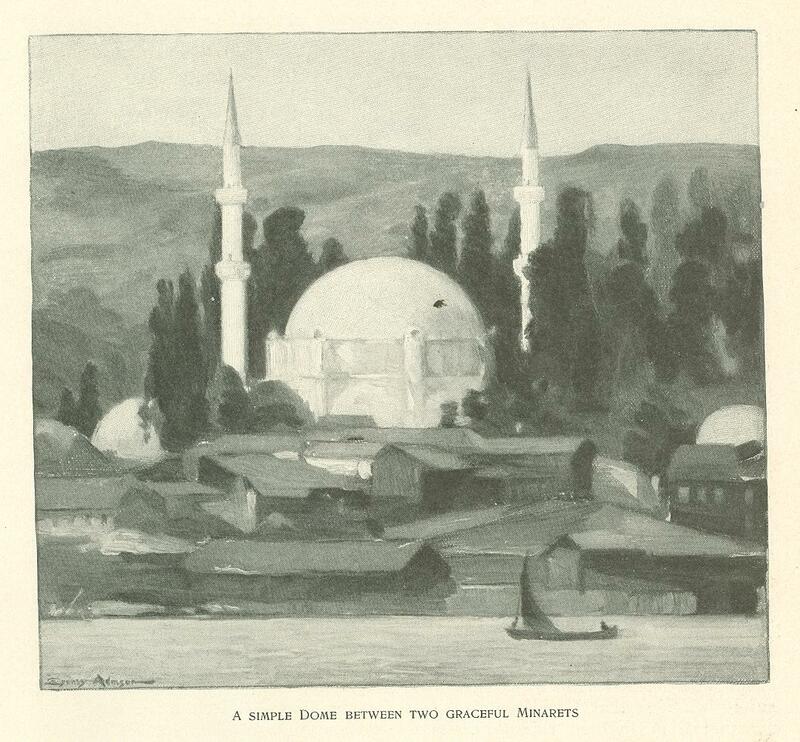 A little way up the Golden Horn, where it bends to the north, stands a large building of the Mevleni Dervishes. It supplies the men who guard the sacred chamber behind the grille. In this build­ing once a week they perform their strange rites, like men waltzing without a partner, until they are tired. Often on my way to the shady cafe opposite the court with the great tree, I paused to watch the chips flying in the little shop where tombstones emerge from blocks of purest marble. Nowhere in the wide world are tombs so perfect as in Turkey. Always they are vertical, flat slabs or rounded columns, broader toward the top, narrow where they enter the earth or are set in rectangular sarcophagi. In carved relief of Chinese character, a woman's monument is sur­mounted by a basket of flowers, decora­tively treated, and usually gilded. On the top of a man's tomb is either a simple stone fez or a large turban. The age and period of a grave appear from the shape of turban. The fez is often painted red; the turban may be white or green. On each column or slab a panel is marked out, and in Arabic relief stands the legend. The raised characters may be gilded, and show on a panel that is painted either green, blue, or black. Set in close array in the shade of a cool cypress grove, the vertical tombs, with the tall, upright, formal trees, make a picture of unusual beauty. Among the other shops that I passed, some kindly faces greeted me behind the intimate appearance of their owners' wares. The lemonade shop had a friendly aspect on a hot day, and here I satisfied a liberal thirst with a dangerous, bub­bling, yellow liquid that seemed the more safe from the impos­sibility of any germ living in its mineral "lemon" flavoring. Here, too, I bought cigarettes from an el­derly Mohammedan from Servia, whose linen drapery sheltered my painting tools on Sunday, when Abra­ham Effendi's shop was shut. Though an Israelite, he for policy closes on Sunday, as the great sewing machine company which he represents is not a Jewish firm. Upon a certain day in Ramadan I came out to see Abraham Ef­fendi, and it was al­ready late in the after­noon. Flags were draped about the entrance to the domed turbeh that stands across the street. Over the window, in gold upon a red cloth, were written the virtues of a saintly grand vizier, whose remains rest within. Two policemen guarded the gateway. Through it we could see a close packed crowd pushing across the pillared entrance into an inner chamber. One of the policemen was he who had brought me permission to paint in the mosque. My friend the Karaite passed in, and soon returned to say that they all listened to a voice chanting. Strange men with pointed white caps bound in green tur­bans, and wearing shaggy sheepskins about their shoul­ders, entered the gate. Among the holy men passing within were faces that seemed vaguely familiar, yet not faces of Eyoub, but rather the phantoms of some strange dream. One was a little old man, lean of body, with a keen gray eye that burned fanatically. He wore a black turban about a white fez. Abraham Effendi asked him if I might enter. With a glance of contempt and scorn, he refused, then hurried in, with the spring of a young man, for all his years. I followed the Karaite to his shop, and after regarding me closely in silence, he spoke. "If you are not afraid, put on my fez and go in." Passing guiltily into the street, I ex­pected all men to stare at this strange thing upon my head. No one even looked at its wearer. Soon I realized that I was protected, almost disguised, as a woman must feel who is closely veiled. The voice had called to the spirit of the two policemen, so I entered an unguarded door and passed across a stone court; then I mingled with. the crowd that pressed within a pil­lared hall. Through an open door the dense crowd entered a chamber that was packed so that no more could fight farther in. A strange voice chanted as the imams chant a prayer. All were too absorbed to no­tice the face of the infidel. I pressed close to the mob, adding only another fez. At last the voice ceased, and a movement began in the crowd. Men climbed on the stone balus­trade of the pillared hall to see the dignitaries pass out. Among them were officers in uniform. They passed through the central hall and entered the domed turbeh with seven tombs that one may see from the street. But evidently the principal attraction had been the service of the strange voice, for many were now departing. An im­pressive graybeard in striped robes and sheepskin halted beside me, and, spread­ing out his palms, began to pray in a loud voice. All eyes were drawn to him, and finding him a dangerous companion, I slipped through the bystanders to the street. One day, before Ramadan, I sat in the cafe opposite the gate of the outer court. Rain was falling. The little stools were tucked beneath the divan skirting the walls, for today no one would sit beneath the dripping trees. A group formed by the window at my left. Looking between their fezzes, I could see the people coming and going from the mosque. 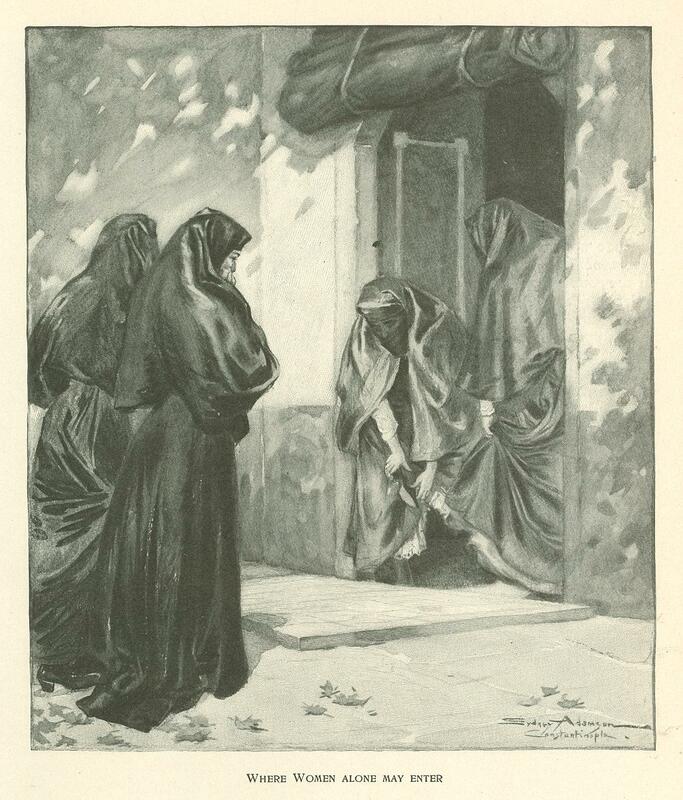 Among them were veiled women in black, mauve, or purple, sometimes striped with silver or gold. Venders of simets and sherbet passed, seeking shelter for their wares. Soldiers rode past, bearing dispatches or leading riderless horses. One remembered then that Italy was carrying war into the islands, and the Turkish governments, truly Oriental in the midst of a crisis, were quarreling among themselves. A police officer entered, and found his man in the group by the window. He seated himself and handed a folded pa­per. With a deprecating gesture and a low-spoken protest, the victim unfolded it gingerly, then read its contents. He folded it up, then offered to return it. Much persistence was required be­fore the police official agreed to receive it. At last he took the paper and abrupt­ly walked out, his sword dangling and his gray lamb's wool fez glistening in the rain as it bobbed down the street. Soon the object of his attention rose, with some word of regret to his com­panions, and vanished. When he had gone they exchanged meaning glances, then leaned together and conversed in low tones. A tiny act in some hu­man drama that perhaps the leaves may whisper of, but wise men hold their peace. Unnoticed, a grave imam had entered, and touching the springs that released his own shoes, he left them on the floor and curled his clean boots under him on the divan. Men saluted him gravely with right hand raised to the temple, almost in military fashion. Some of the poorer ones stood up to offer him their greeting. Turks profess to have no caste, only the rich and the poor, and any man may rise to be the grand vizier. Yet in spite of this there exists a military caste, and the clergy, or hojas. The man who sat facing me was a cleric of the finest type, and a man of personal character and dis­tinguished bearing. His features were fine, the gray eyes had a commanding glance. His beard and hair of silver gray were neatly trimmed, and around his fez the white turban of his order was carefully wound. Over a striped cot­ton jacket he wore a long, dove gray coat and baggy, gray trousers. His hands were fine and perfectly cared for. One of them gently ca­ressed a rosary of amber beads. Be­tween sips of coffee he enjoyed a ciga­rette. Other hojas arrived and grouped themselves around him. Then a Turk in European clothes, save only the fez, arrived, and was greeted warmly by the clerics. They conversed with much animation, and it was clear the new­comer was a man of some importance. At the tables sat poorer men with col­ored cloths around their waists. A cafe attendant entered from the street with a long stick on which hung simets. These are a kind of bread made in large rings and covered with seeds. To my sur­prise he laid a simet in front of each guest on his table, or gave it in his hand. But he passed me as the only infidel in the cafe. One of the hojas called him and whispered a few words. The attend­ant then brought a simet and laid it before me on my table. The others began to eat their simets and I followed their example. Soon the same attendant came in with glasses of sherbet made from fresh fruit juice in sweetened water. These glasses he set before each guest as he had done the simets. All accepted as if this strange attention were a matter of everyday occurrence. No one had ordered these things, and no one declined. After the sherbet and simets had disappeared I threw down a coin to pay for the tea that I had on first entering, curious to see if the simets and sherbet were to be charged for. They were not. I arose, saluted the company, especially the hoja who had included me in this strange feast, and left the place. When the chief imam reads from the Koran to the students, he thus gives of his bounty to whoever may be in the cafe, that men may know of his piety and praise Allah. So it was afterward explained. 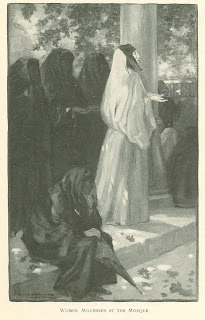 Each day, as I sat painting in the inner court when the noonday service was over, and sometimes, too, in the afternoon, the people gathered around a coffin covered with rich shawls set upon the ground before the gri11e. Reverently all palms were upturned while an imam intoned the service for the dead. Toward the end the people echo "Ameen" after every phrase. When the imam stops, all draw their palms downward, each over his own face, and it is finished. The coffin is lifted shoulder high, and the bearers give way readily to any stranger who, for a few steps, will carry the burden, and thus gain sanctity in the eyes of God. Up in the cemetery an open grave awaits. The dead are buried without the coffin, dressed only in their last wrap­ping. Water is sprinkled upon the earth, and while the mourners squat among the tombs the last rites are spoken. A priest chants for a time, and the end is a prayer. Then the beggars and the blind and the homeless children, who have gathered a little way off, are given alms by the mourning relatives. At last there is only a freshly watered grave among the countless thousands that dot the hill beneath the dark cypresses. The kites cry shrilly, circling above the trees. Storks flap lazily past, rattling their bills. Here they are known as hadji baba, for, as everyone knows, the storks of Eyoub migrate only to Mecca, and before they go for their winter pilgrimage they visit the court of the mosque and its sacred shrine. From a point where I often sit in the cemetery a single minaret rises among the cypress trees. On the distant hill stands the magnificent Sulieman Mosque, a finger print upon the horizon. Not far from it, in the distant city, one can see the minarets of the Mosque of Moham­med II. the conqueror, who planted the great plane tree below and caused the first stones to be set of what is Eyoub today. It is a sacred name that has come down from the time of the Prophet, through all the ages, and lost nothing of its spell. The anointing place of sultans, where the most holy dervish of Konia, the Chelebi Effendi, girds that mysterious sword of Osman upon the Commander of the Faithful, Eyoub is the beginning of all things Turkish, as, in its sacred tombs, it is the end. Where all their great must enter, Eyoub is sure­ly the gate of the dead. Originally published in Harper's Monthly Magazine. June 1913.